A trend-setting, zany, hilarious comedy - using the airplane disaster film, such as Airport (1970), as a spoof stepping stone, from the comedy writing/directing team of David Zucker, Jim Abrahams and Jerry Zucker (known colloquially as ZAZ and their brand of "ZAZ humor"). This film was preceded by their screenwriting for John Landis' The Kentucky Fried Movie (1977) (the ZAZ trio of comedy writers were known as The Kentucky Fried Theater when they performed as a Wisconsin comedy troupe), and later followed by Top Secret! 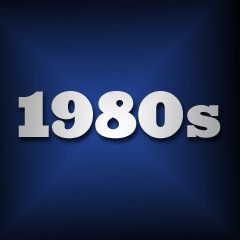 (1984), and Ruthless People (1986). Airplane's plot is an excuse for a frantic, slapstick parody filled with visual-sight gags, puns, verbal literalism ("Surely you can't be serious." "I am serious, and don't call me Shirley"), rapid-fire satirical wisecracks, irreverent references to From Here to Eternity (1953) and Saturday Night Fever (1977) disco dancing, and visual non-sequiturs. Shell-shocked ex-military flyer Ted Striker (Robert Hays) pursues girlfriend Elaine (Julie Hagerty) - a stewardess on an ill-fated flight with stricken pilots. This movie also revitalized the acting careers of Peter Graves, Lloyd Bridges, and Robert Stack, and launched the comedy career of Leslie Nielsen as the straight-faced, dead-panning doctor, who up to that time was known mostly for B-movie dramatic roles, in films like Forbidden Planet (1956) and The Poseidon Adventure (1972). Followed by a less funny ZAZ-less Airplane II: The Sequel (1982) by director Ken Finkleman. This anti-war film's setting was during the era of the brutal Boer War (1899-1902) between the Boers (Afrikaaners) and the British Carabineers in the area of the Northern Transvaal - it was a struggle for independence. During the fighting, the elite Bushveldt Carabineers (Australians) were ambushed and Captain Hunt was captured, mutilated and killed. In revenge, Lt. Harry "Breaker" Morant (Edward Woodward) and his men took and executed prisoners. To end the war with the Boers and appease the Germans, British general Lord Kitchener selected three scapegoats to be put on trial: Morant, Lt. Peter Handcock (Bryan Brown) and Lt. George Witton (Lewis Fitzgerald). Lt. Colonel Denny (Charles Tingwell) presided over the 5-person general court-martial tribunal, held in a remote courtroom. Major Charles Bolton (Rod Mullinar) prosecuted, while inexperienced defense attorney Major F. Thomas (Edward Woodward) defended the three hapless soldiers in a sham trial. Thomas valiantly struggled to defend the men, arguing that in such an unconventional war, there were bound to be casualties, and unclear instructions about how to treat the enemy. Handcock and Morant were sentenced to death (and shot at sunrise), while Witton was sentenced to life (although released after three years). The second in the famous Star Wars trilogy of fantastic science-fiction films, often rated as the best in the trilogy, with stunning special-effects, great characters and a rich, comic-bookish storyline. Again, evil Darth Vader continues to aid the Emperor to determinedly crush the Rebel forces. The Rebel Alliance, on the frozen and icy planet Hoth, are threatened by troops attacking from the Galactic Empire, and space jockey Han Solo (Harrison Ford) and Princess Leia Organa (Carrie Fisher) - with the Wookie Chewbacca and the two robotic droids (R2-D2 and C-3PO) - flee to Cloud City ruled by supposed-ally Lando Calrissian (Billy Dee Williams). Meanwhile, young Luke Skywalker (Mark Hamill) is mentored about the wise ways of the Force and Jedi Knights by the last great Jedi Master, a gnome-like, swamp-dwelling Yoda on the planet Dagobah. The film culminates with a climactic show-down between Luke and Darth Vader. Followed by Return of the Jedi (1983). A magnificently visceral, vivid and real, black and white bio/docu-drama of the rise and fall of a violent, suicidally-macho prize-fighter. Hard-headed, animalistic, unlovable slum kid Jake LaMotta (Robert De Niro) becomes the 1949 middle-weight champ. The boxer experiences bouts of ring and domestic violence with brother Joey (Joe Pesci) and second, beautiful teenage wife Vikki (Cathy Moriarty), and slowly but predictably descends into fat slobbishness. Robert De Niro's transformation from a sleek professional boxer to an out-of-shape, stand-up nightclub entertainer is simply remarkable. This film is regularly voted the Best Film of the decade of the 80s. Creative director Stanley Kubrick's intense, epic, gothic, haunted house horror film masterpiece. It followed the disintegrating Torrance family -- aspiring writer Jack Torrance (Jack Nicholson), his wife Wendy (Shelley Duvall), and son Danny (Danny Lloyd) who became affected by a "psychic photograph" of a bloody series of historic murders committed in an imposing, remote Rocky Mountain hotel, the Overlook. The film had beautiful, stylish work that distanced itself from the blood-letting and gore of most modern films in the horror genre. The film's source material from science-fiction/horror author Stephen King's 1977 best-selling novel (his third novel under his own name) of the same name bore little resemblance to Kubrick's creation. The film's title referred to the extra-sensory, paranormal psychic abilities possessed by the Overlook's head cook Halloran (Scatman Crothers) and Danny. With American co-screenwriter Diane Johnson, Kubrick moved from the conventions of traditional horror film thrillers, displacing them with his own, much more subtle, rich, symbolic motifs. An unusual public dispute occurred when a dissatisfied King denounced Kubrick's adaptation, in part over the casting of Jack Nicholson in the lead role, the character's personality and motivations, the misogynistic depiction of Jack's wife Wendy, and the film's de-emphasis of some of the novel's prominent supernatural themes. In retaliation, producer/writer King remade the film as a 3-part ABC-TV mini-series in 1997 which was generally considered inferior to the original. As in many of his films, director Kubrick explored the dimensions of the genre to create the ultimate horror film of a man going mad, Jack Torrance (Nicholson in an over-the-top performance), while serving as an off-season caretaker of an isolated, snowbound resort with his family. With sleep deprivation and growing dementia, he eventually became truly insane and possessed by the hotel's haunted, misogynistic and murderous history. With a smiling, demonically-insane, shining face (and trademarked sneer and arching eyebrows), he began to homicidally stalk his own family members with an axe ("Heeeere's Johnny! "), now transformed into a cartoonish, rampaging aggressor. Unable to destroy his future posterity, he froze to death in a convoluted garden maze. Kubrick deliberately reduced the pace of the narrative and expanded the rather simple plot of a domestic tragedy to over two hours in length, created lush images within the ornate interior of the main set, added a disturbing synthesized soundtrack (selecting musical works from Bela Bartok, Gyorgy Ligeti, and Polish composer Krzysztof Penderecki), used a Steadicam in groundbreaking fashion, filmed most of the gothic horror in broad daylight or brightly-lit scenes, and built an unforgettable, mounting sensation of frustration, rage, terror, ghosts, and the paranormal.